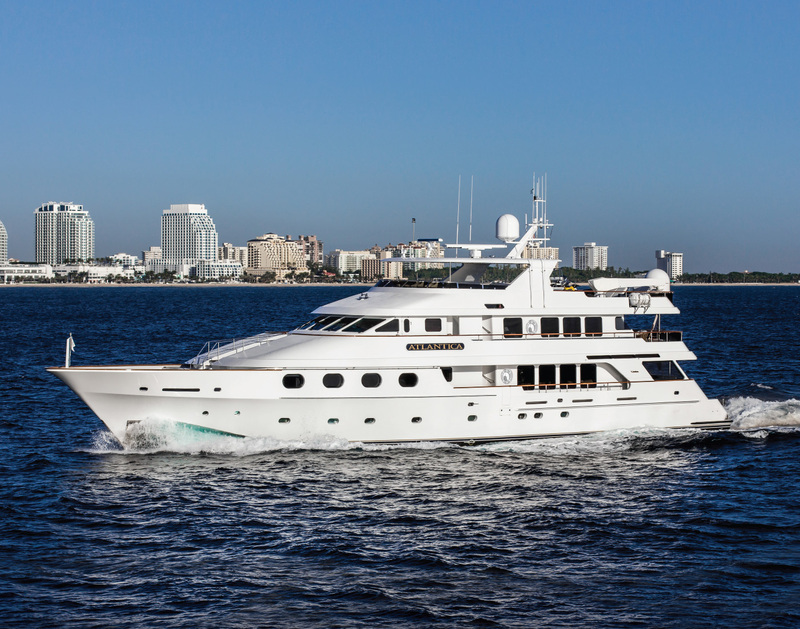 Luxury Motor Yacht QUEEN D (ex ATLANTICA) is 41m or 135ft in length and was launched in 2000 from the Christensen shipyard. 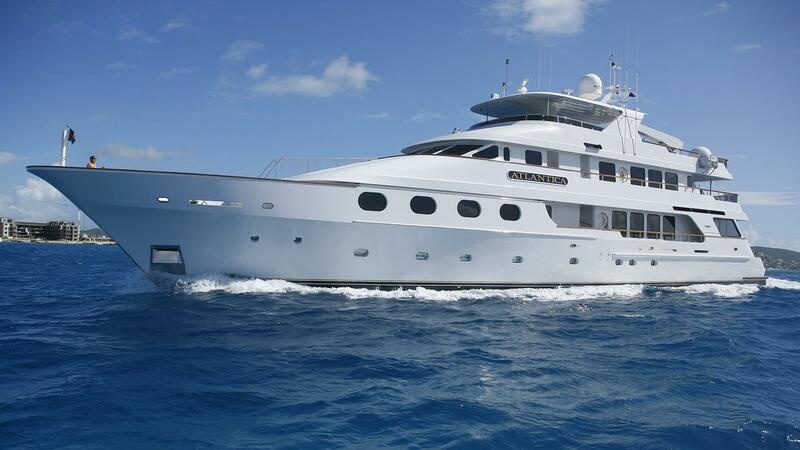 In 2008, she underwent a refit with various mechanical and decorative improvements including new furnishings and many new water toys. 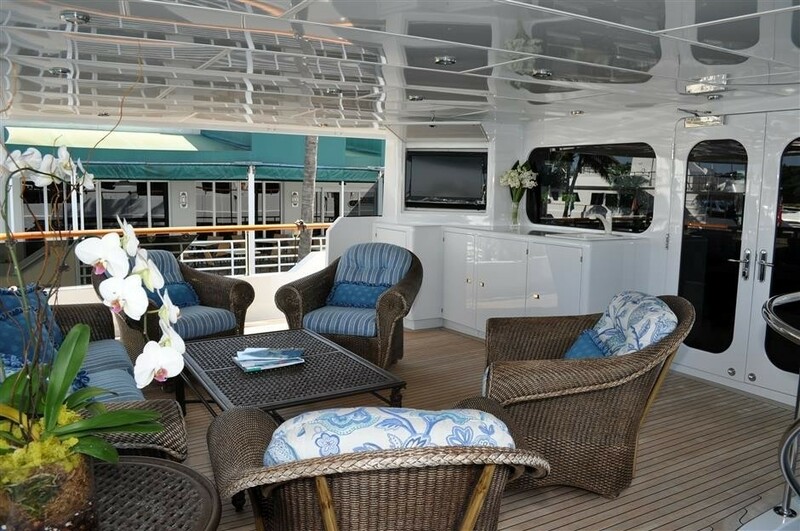 Onboard you will be pampered with attention to every detail from the professional crew of eight as you relax in elegant surroundings. 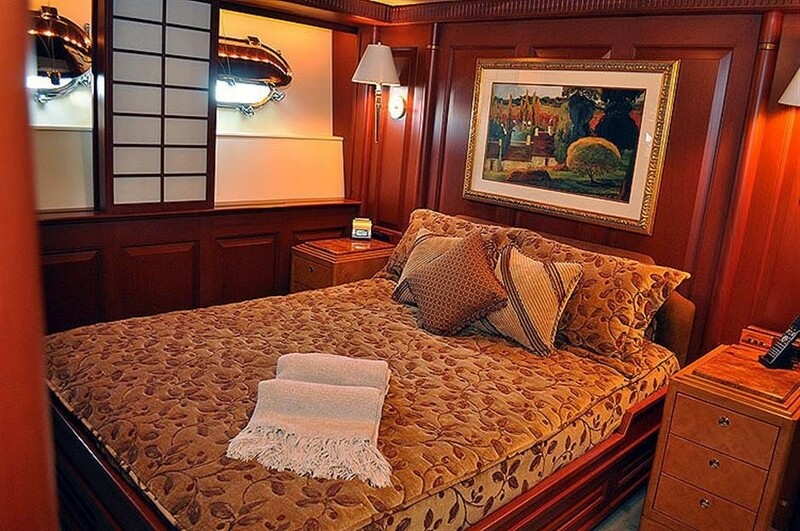 QUEEN D could almost feel like 'home' with large oversized cabins and furnishings imported from London. 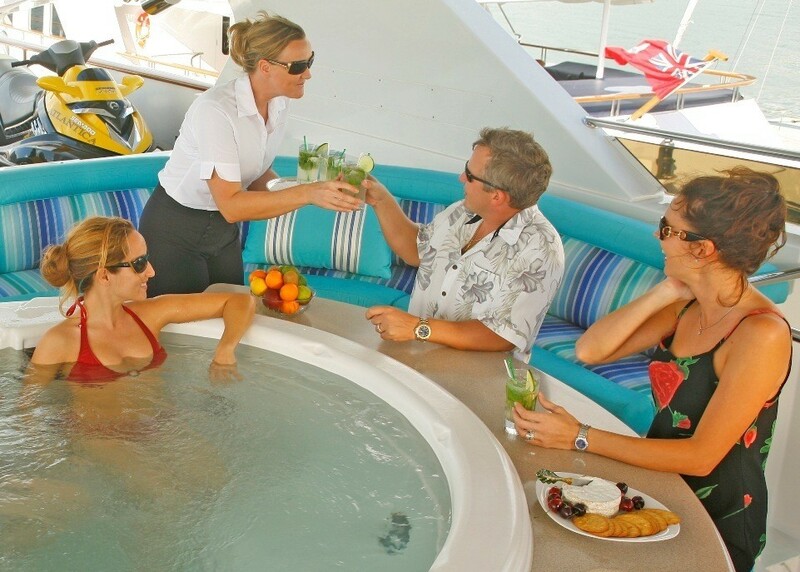 Whether you're looking for solitude and relaxation, or a little excitement, the professional crew of 8 will take care of everything onboard. 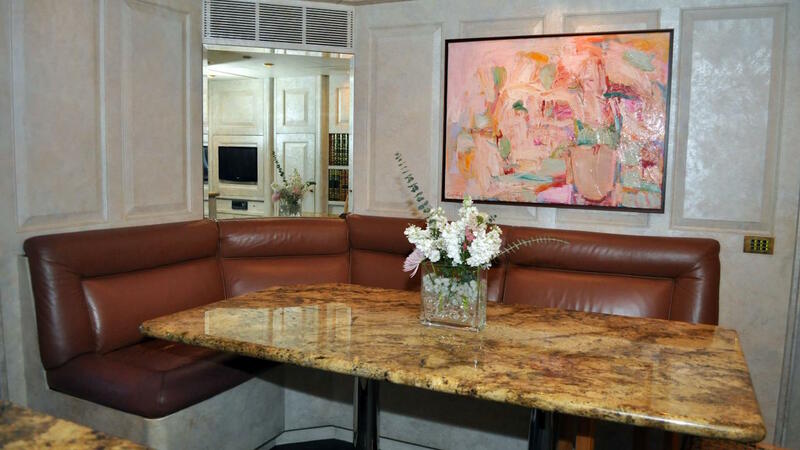 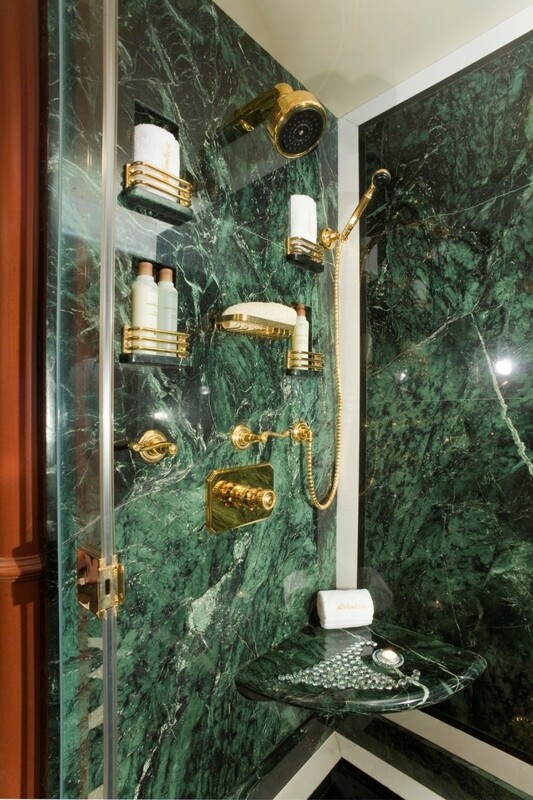 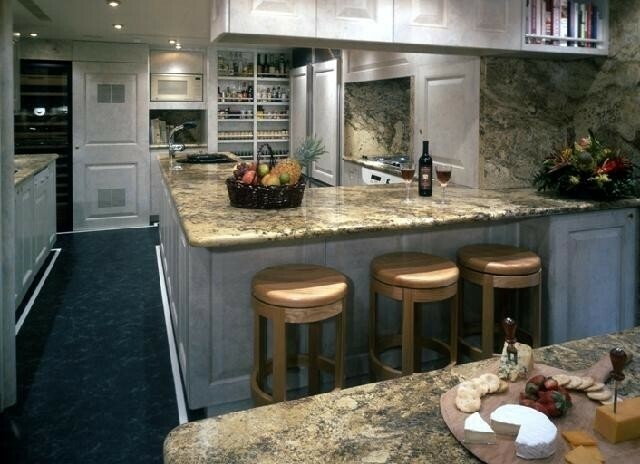 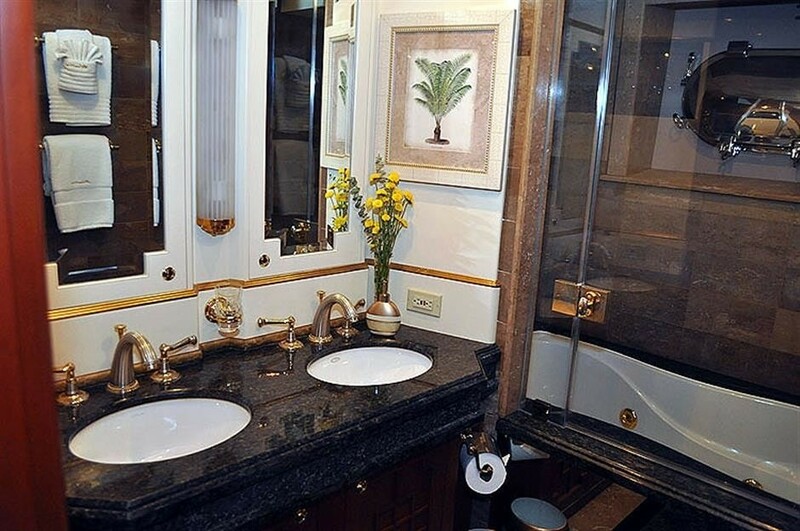 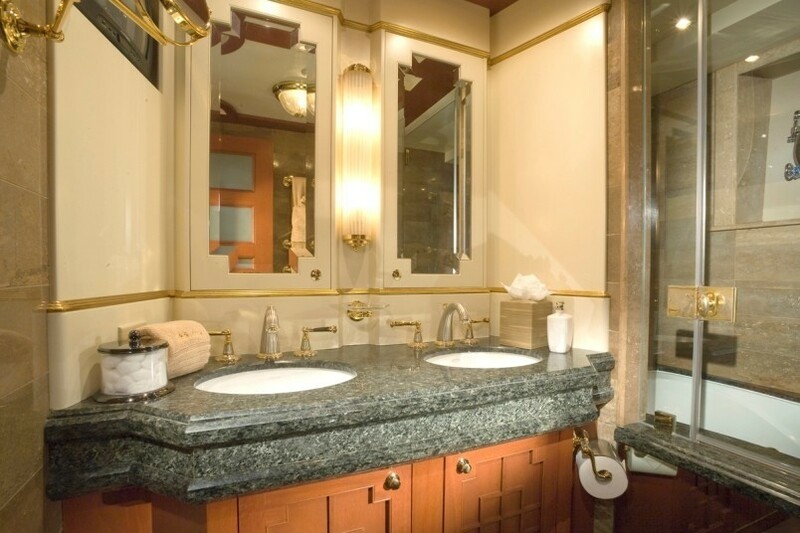 This luxury is extremely tasteful, stylish and luxurious with interior design by Donald Starkey. 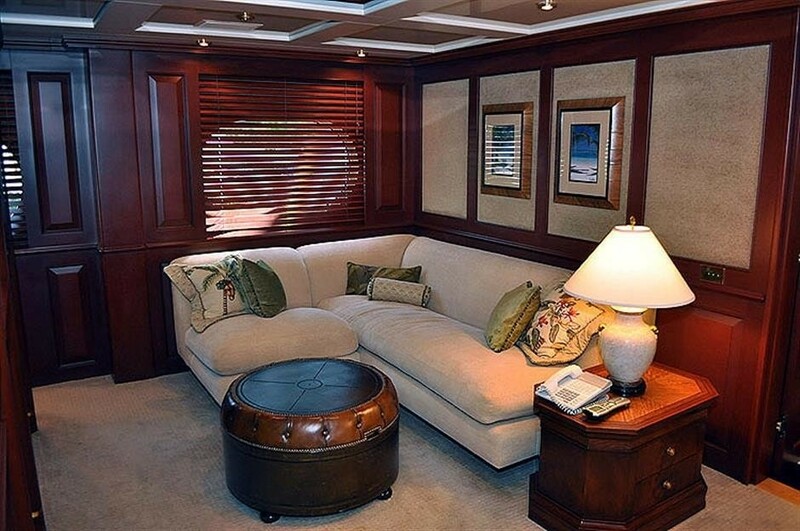 She provides elegantly joined raised-panel mahogany bulkheads, and her beautiful furnishings create a warm and comfortable ambience. 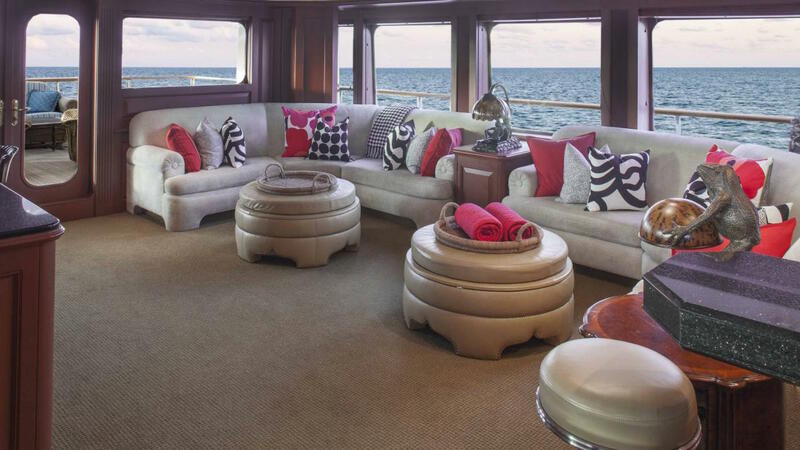 Her main salon is furnished with characteristic rugs and large overstuffed couches with face the pop-up TV and entertainment system. 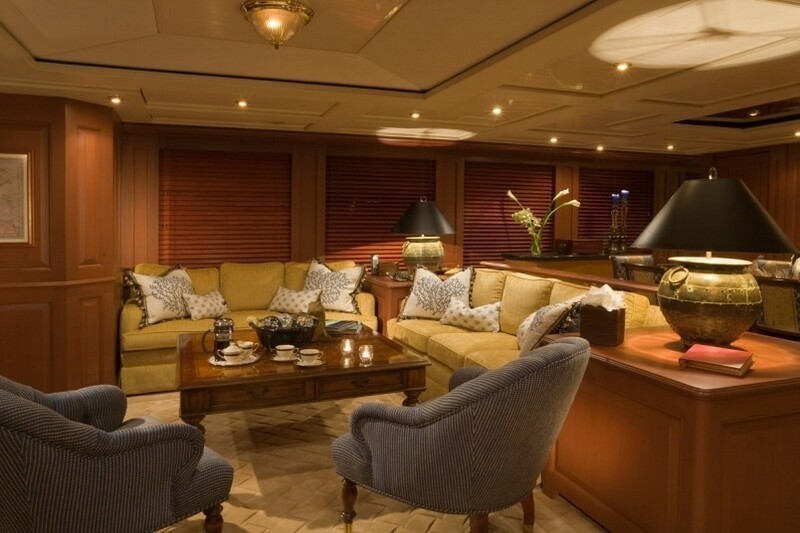 The sky lounge on the upper deck provides another excellent entertainment area including a bar, high-backed couches and a projection-screen with full audio visual facilities including karaoke. 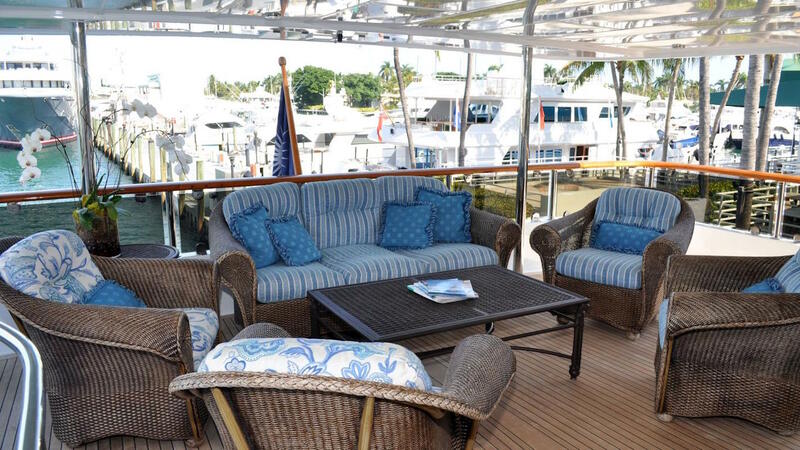 The sky lounge looks and feels spacious due to her extension onto the upper deck. 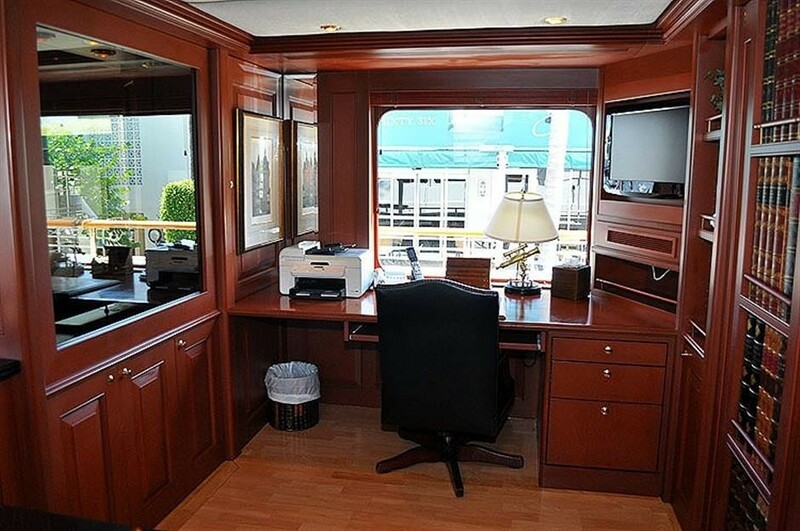 For those who wish to keep in touch while on vacation, QUEEN D is equipped with a fully equipped office including WIFI internet. 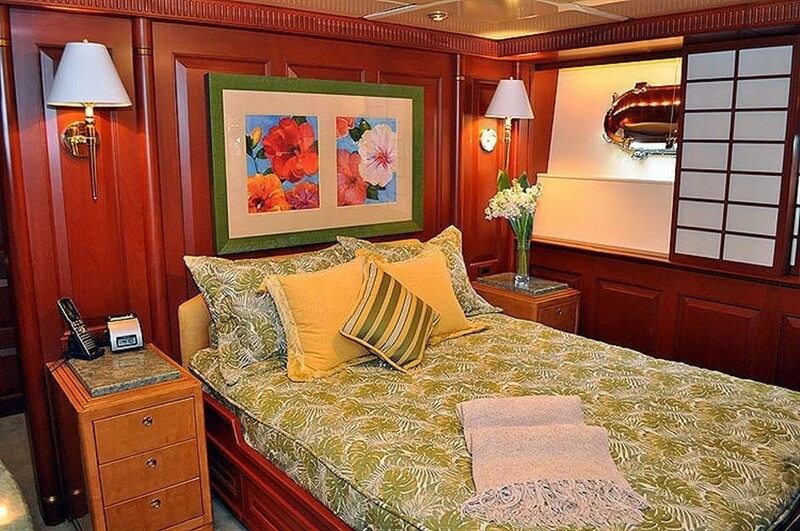 This luxury yacht comfortably accommodates 10-12 guests in five spacious cabins, and the master stateroom can be transformed into two bedrooms – his and hers – ideal for light sleepers or heavy snorers! 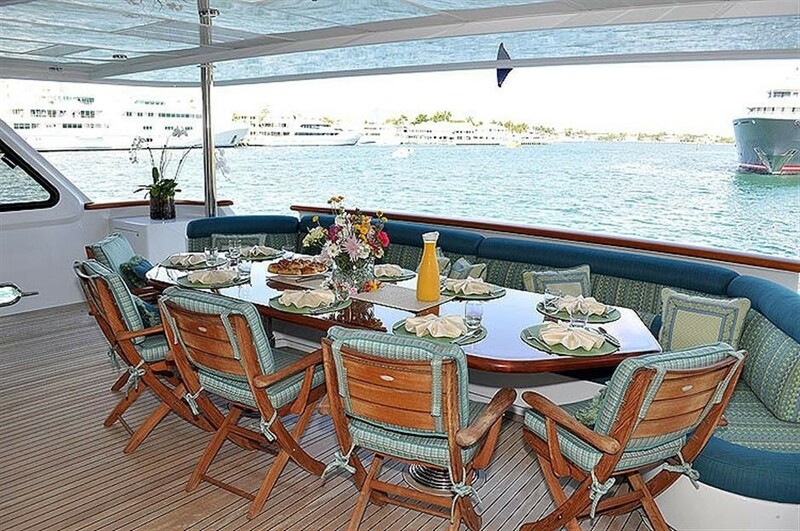 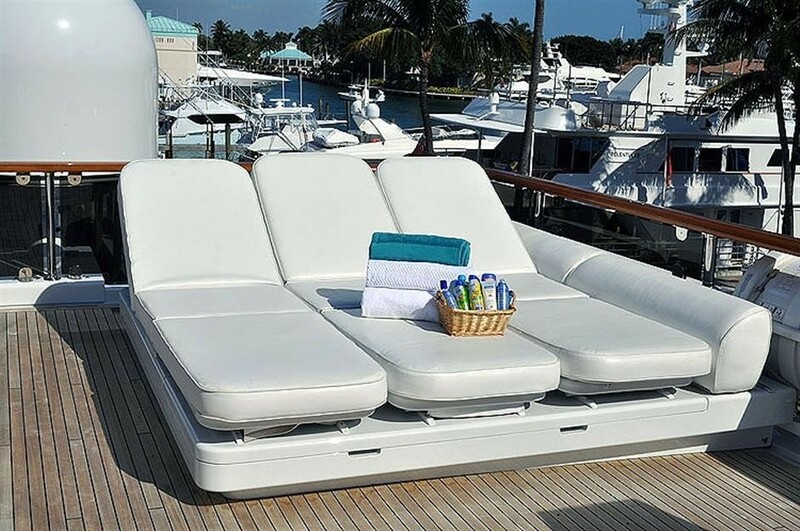 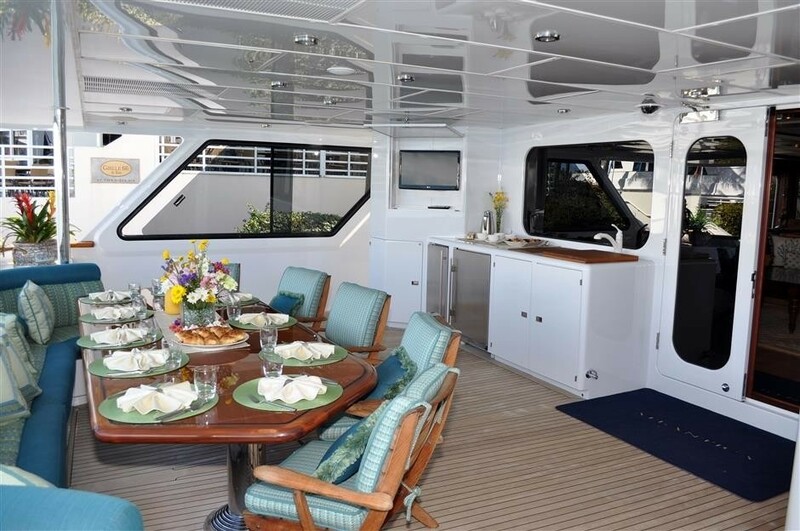 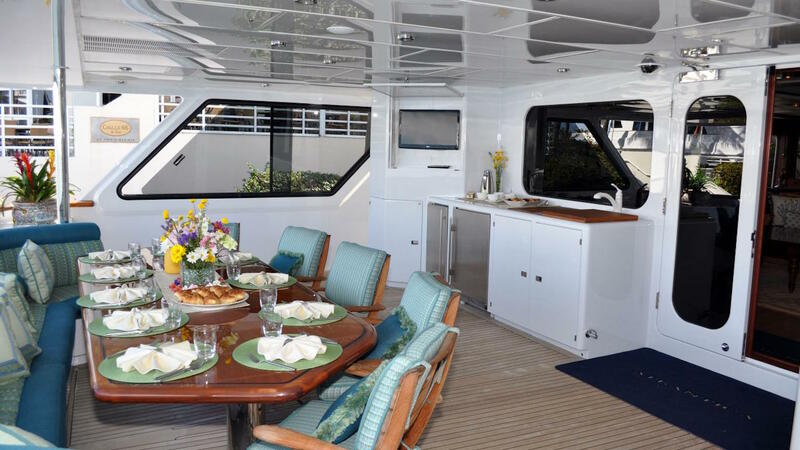 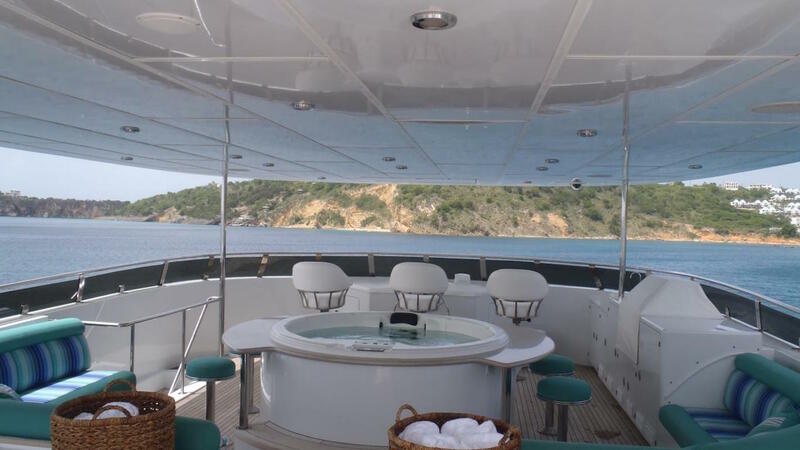 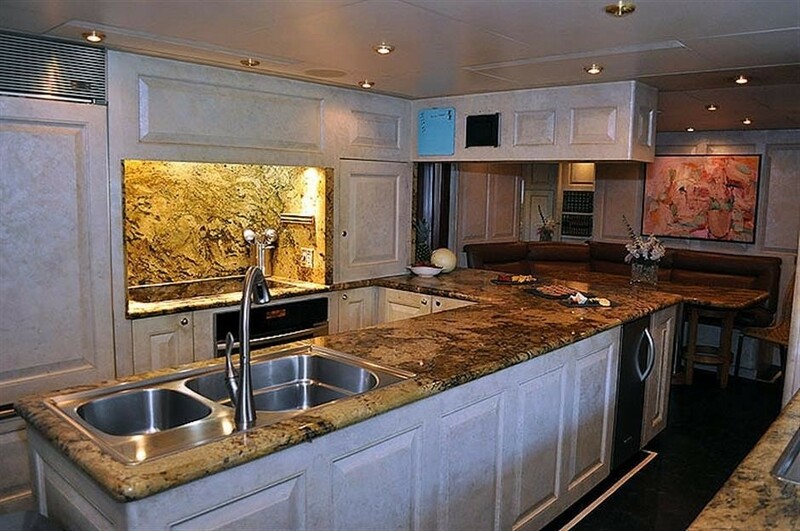 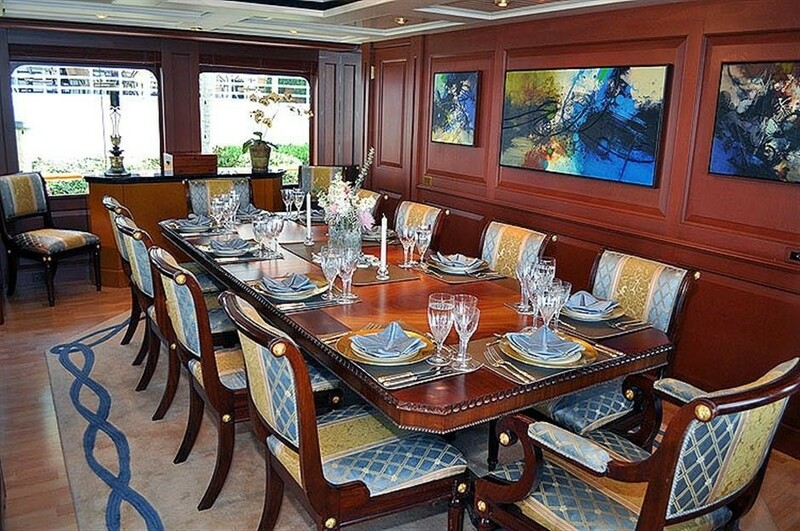 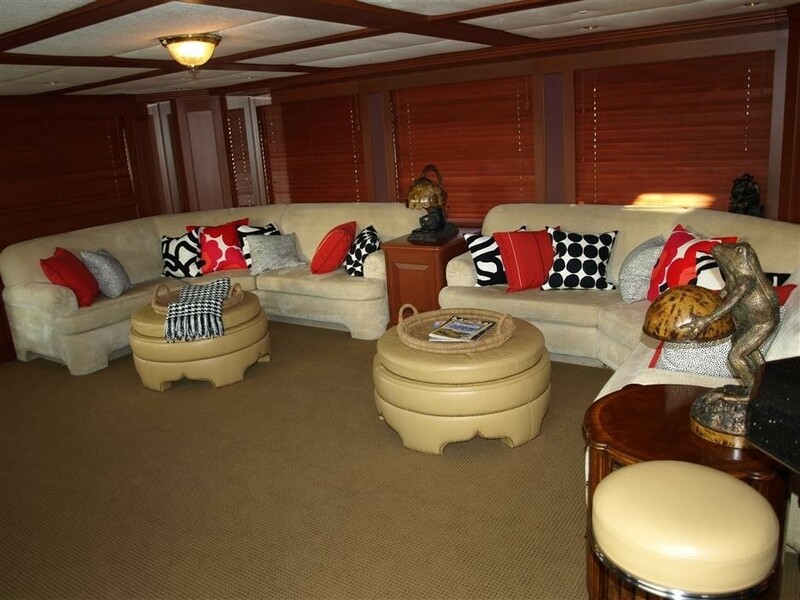 On deck, there is plenty of alfresco entertainment areas, including full dining for 12 guests on the lower aft deck, a casual bar and seating area on the upper aft deck. 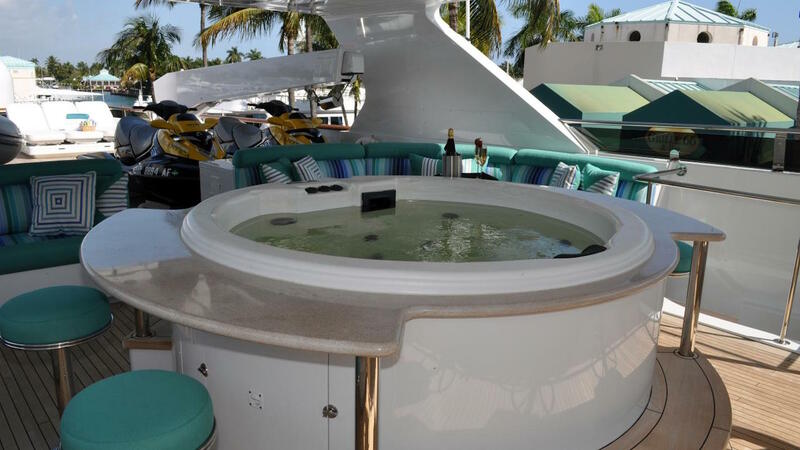 The magnificent sundeck hosts a semi-circular lounge seating, a Spa Pool, a bar with stools, sun pads and a BBQ grill and entertainment area. 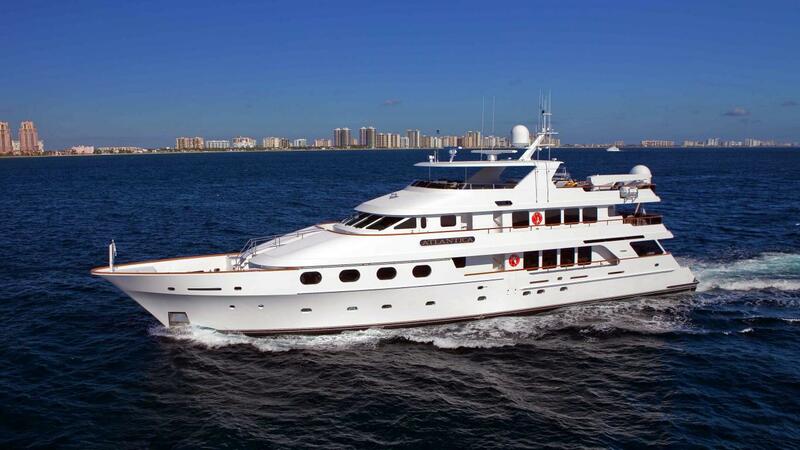 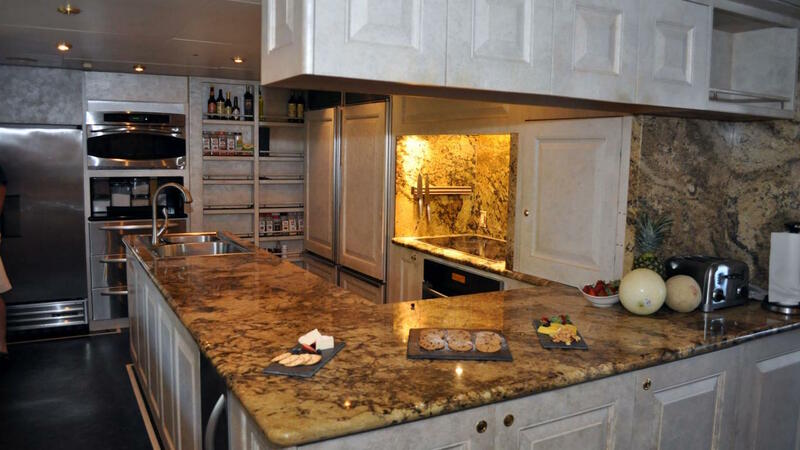 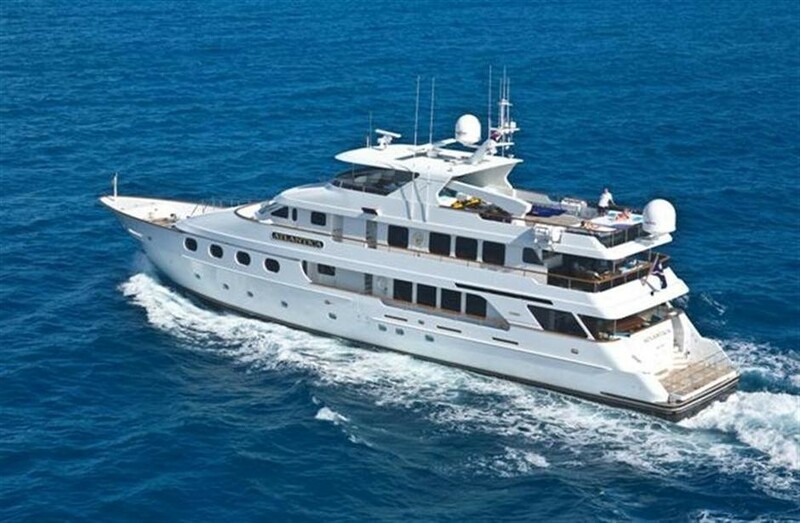 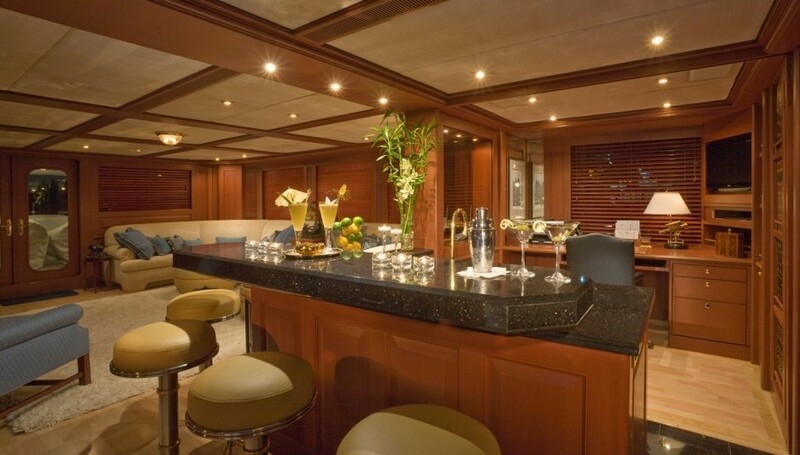 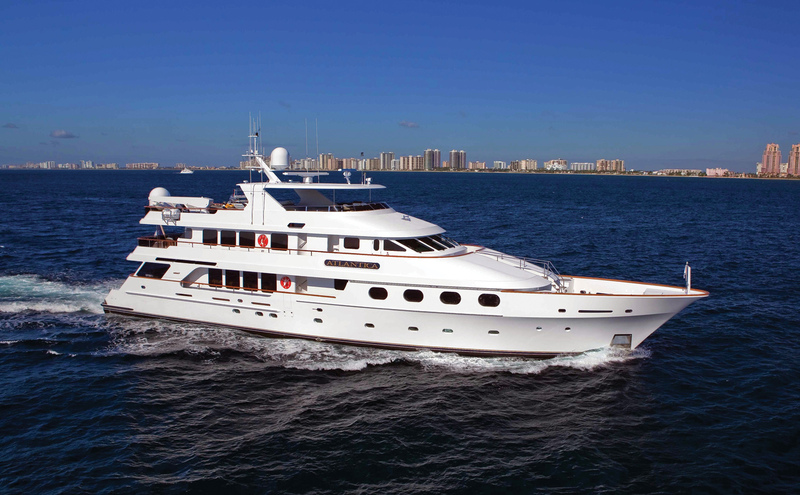 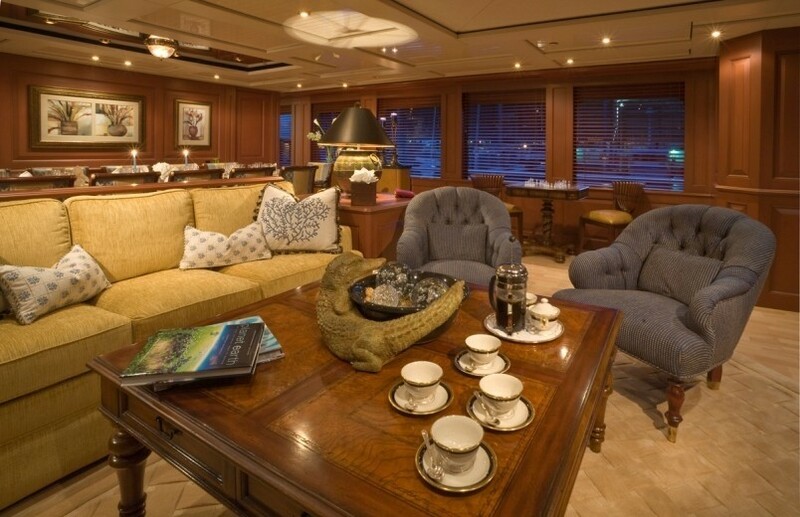 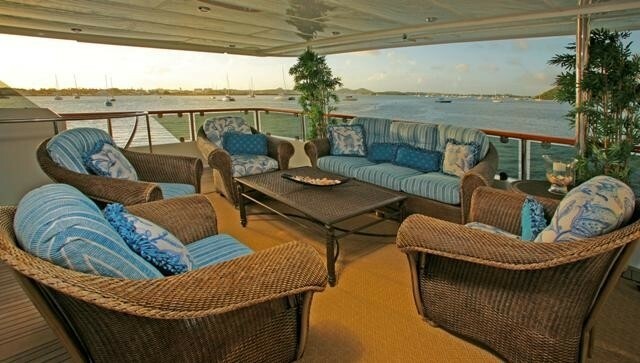 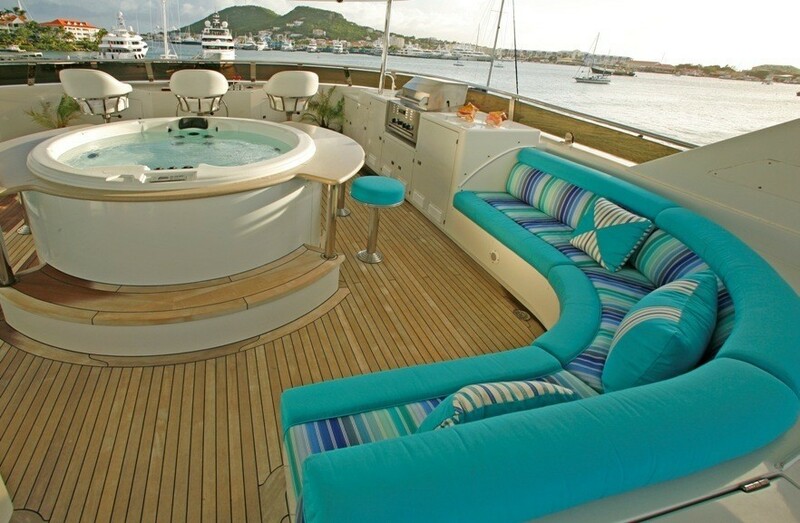 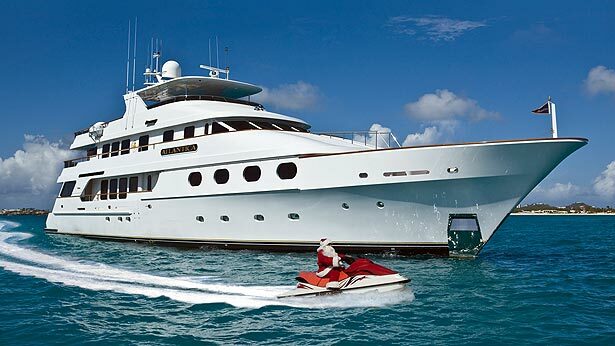 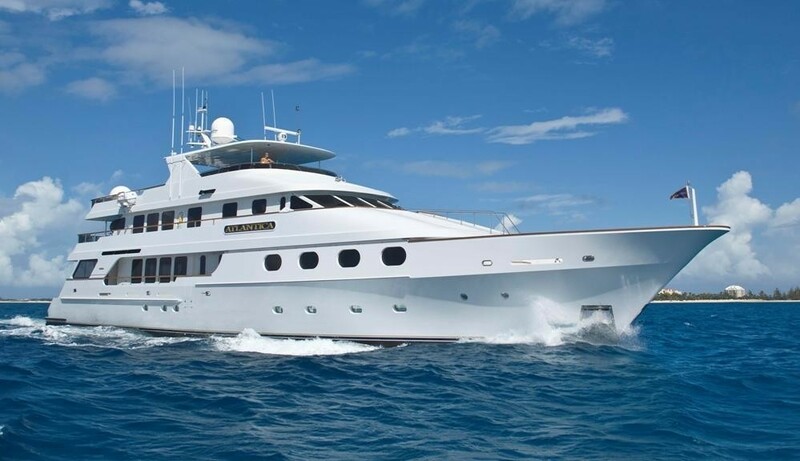 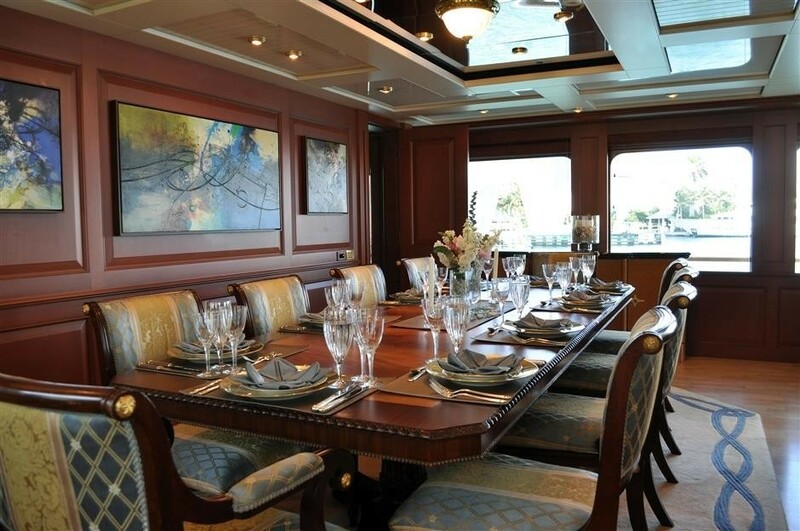 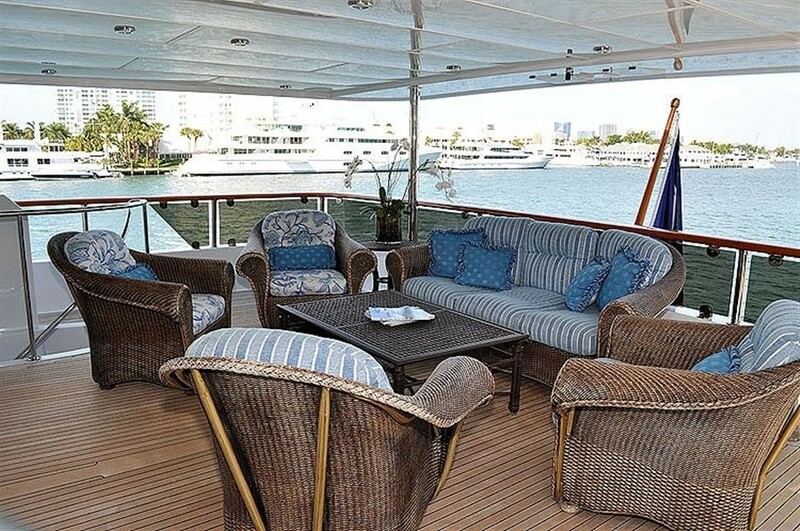 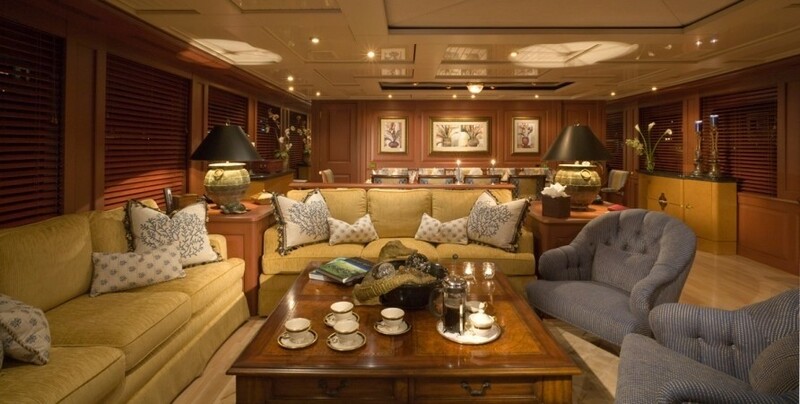 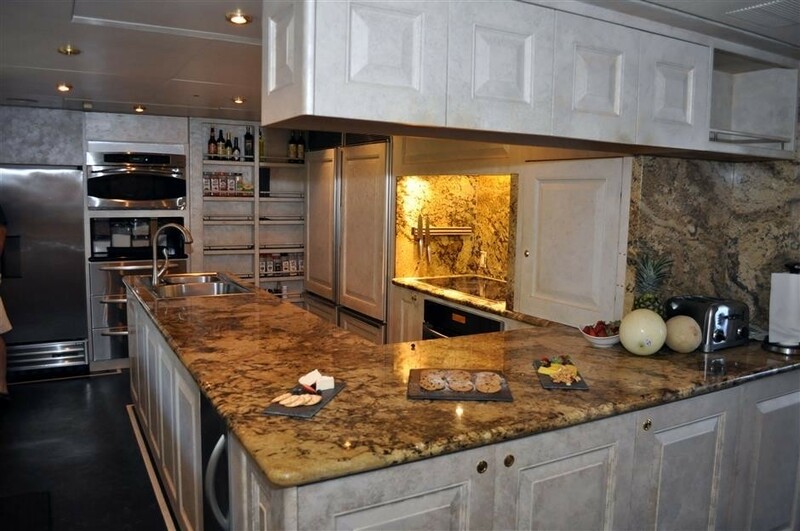 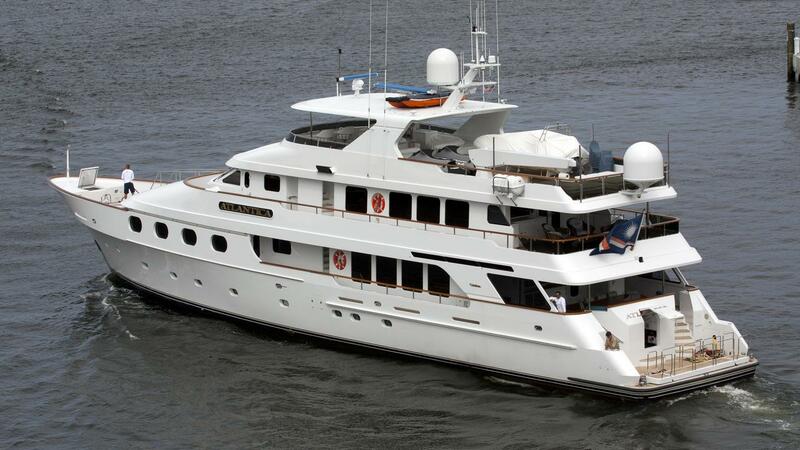 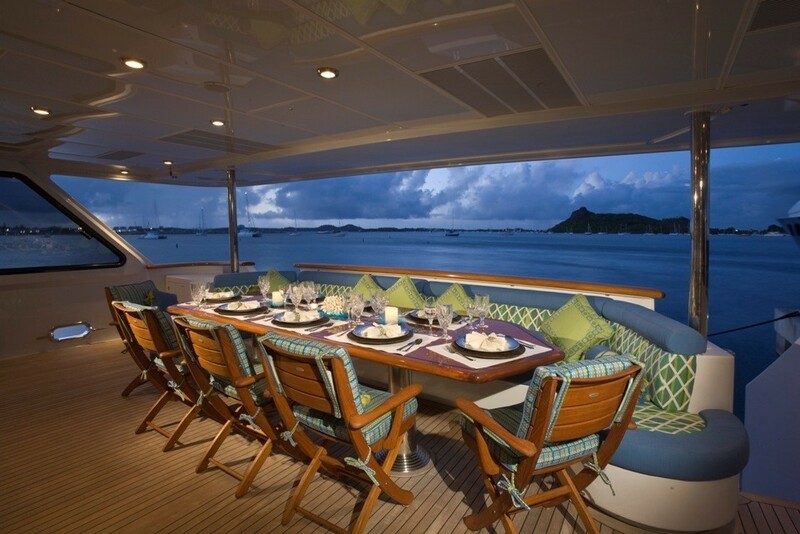 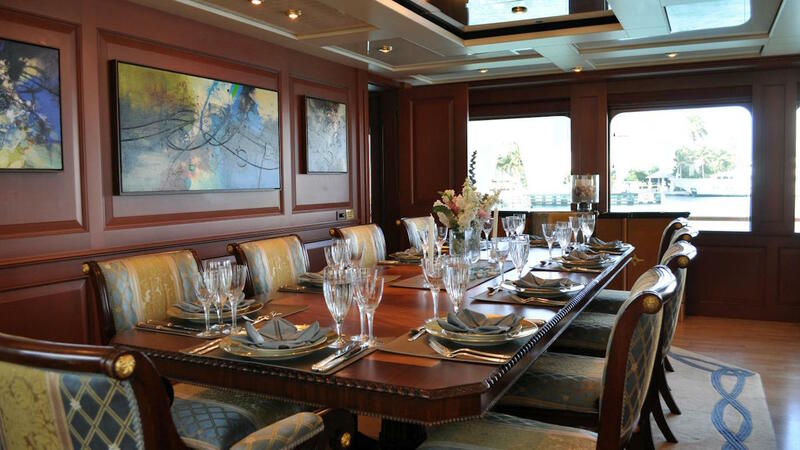 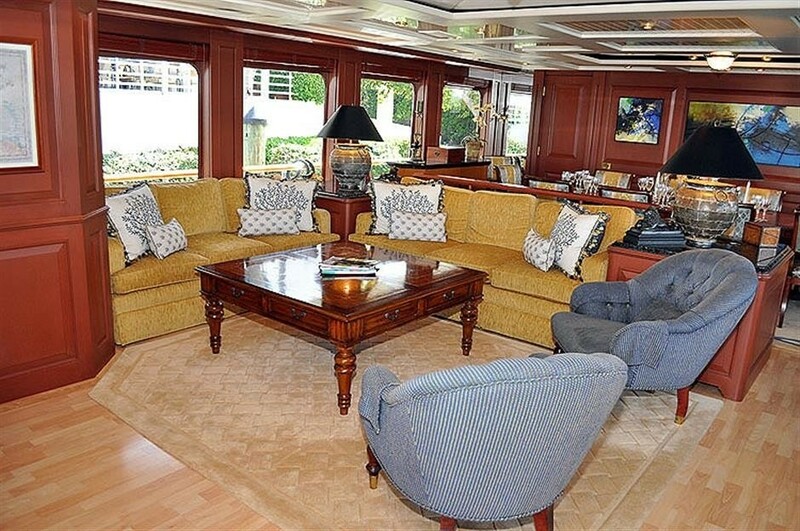 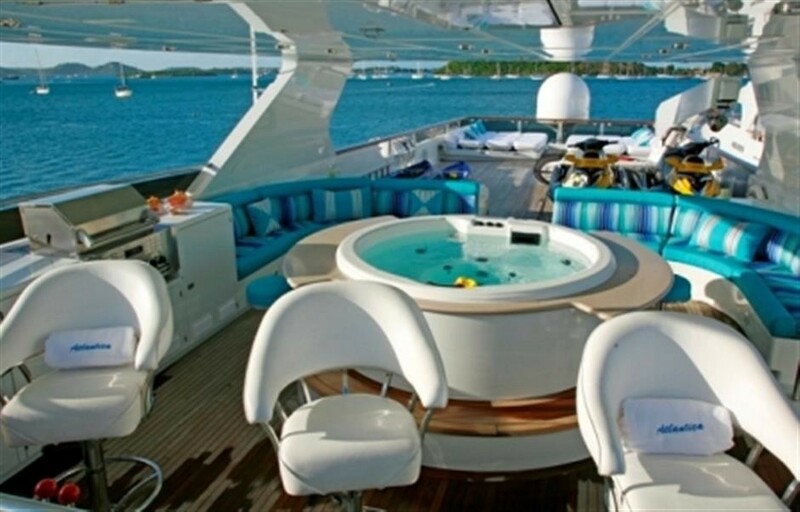 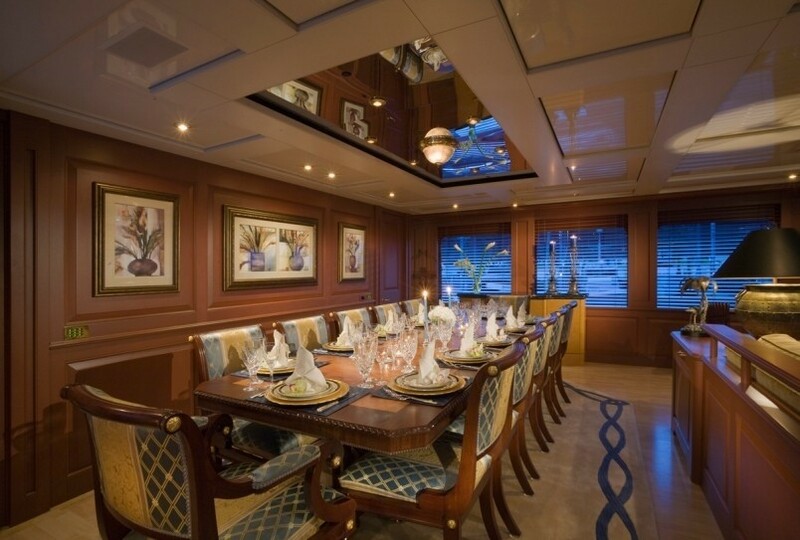 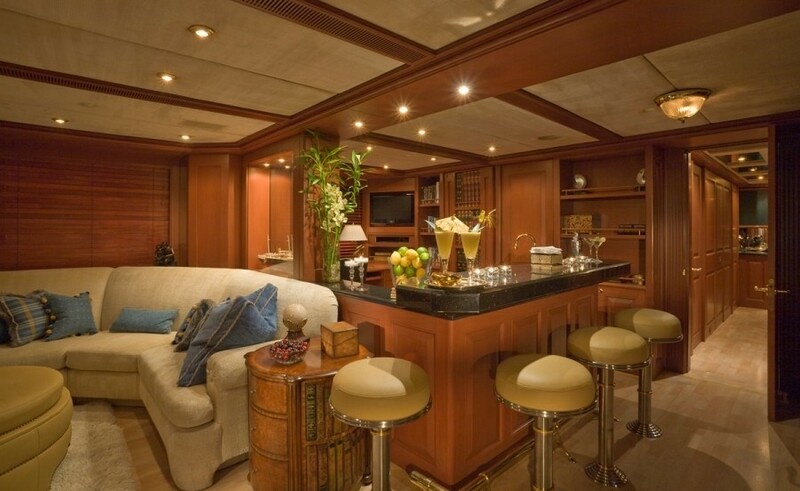 Motor Yacht QUEEN D offers spacious and comfortable accommodation for 10-12 guests in 5 cabins. 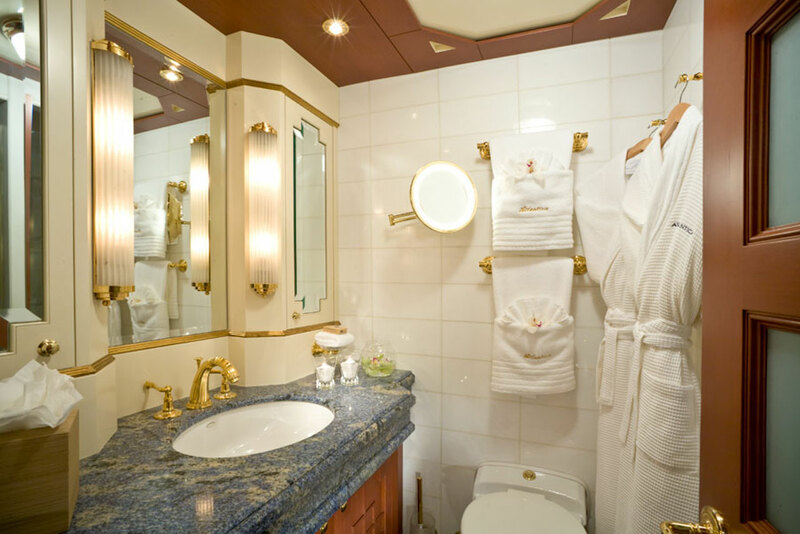 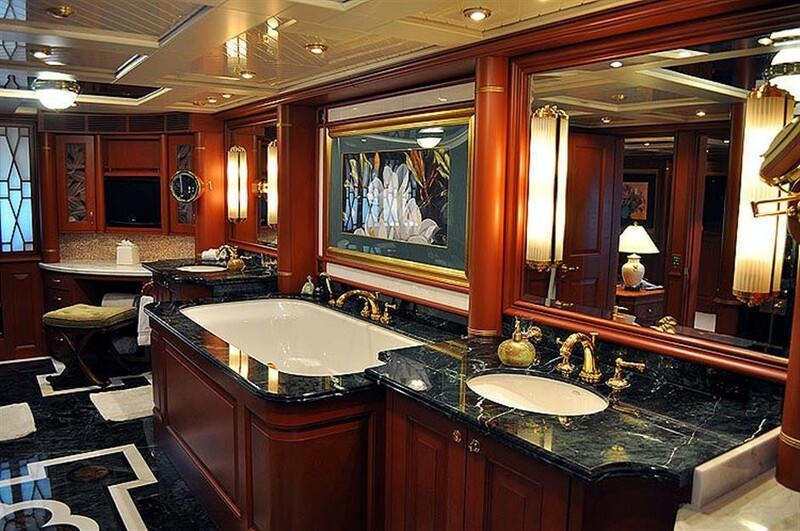 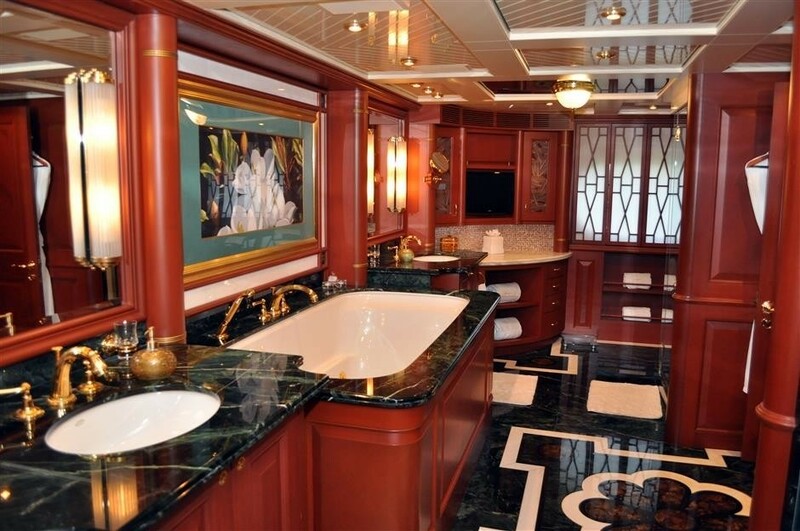 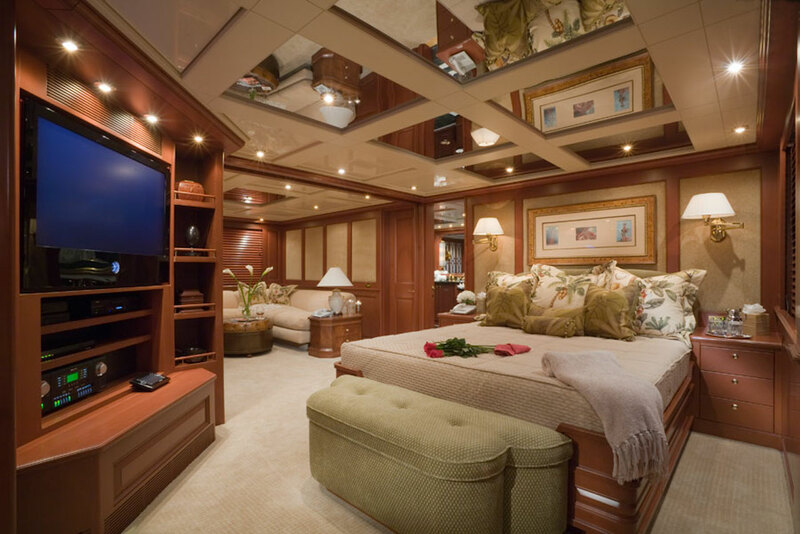 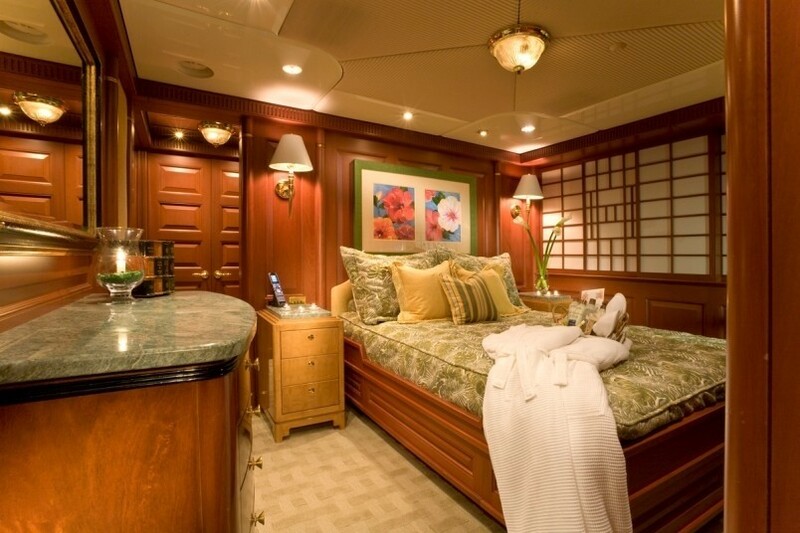 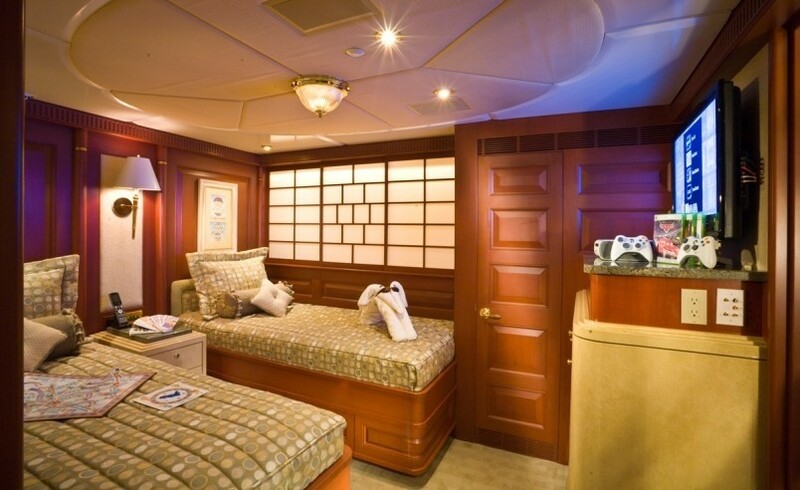 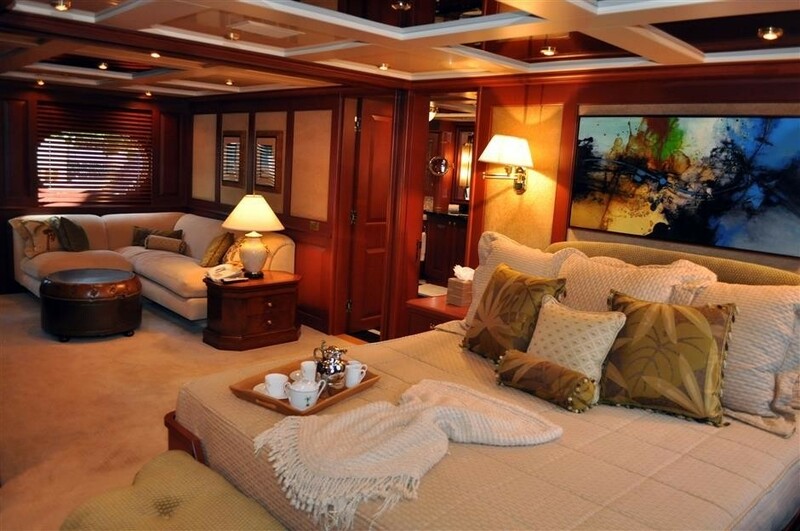 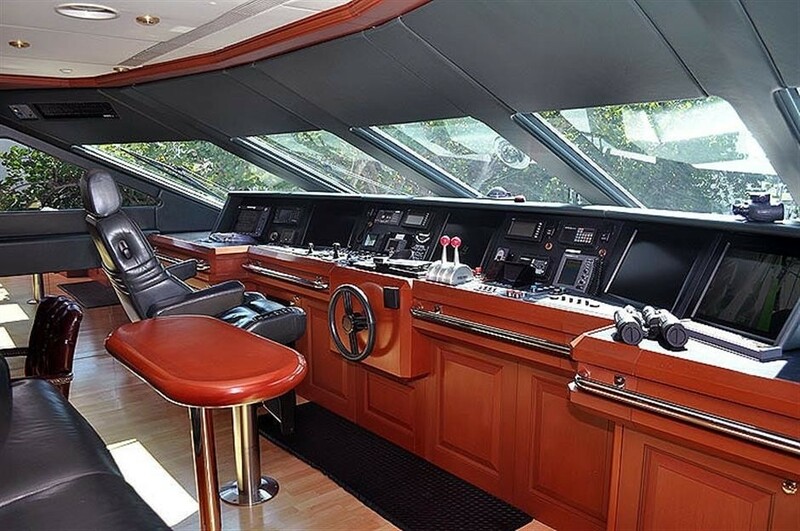 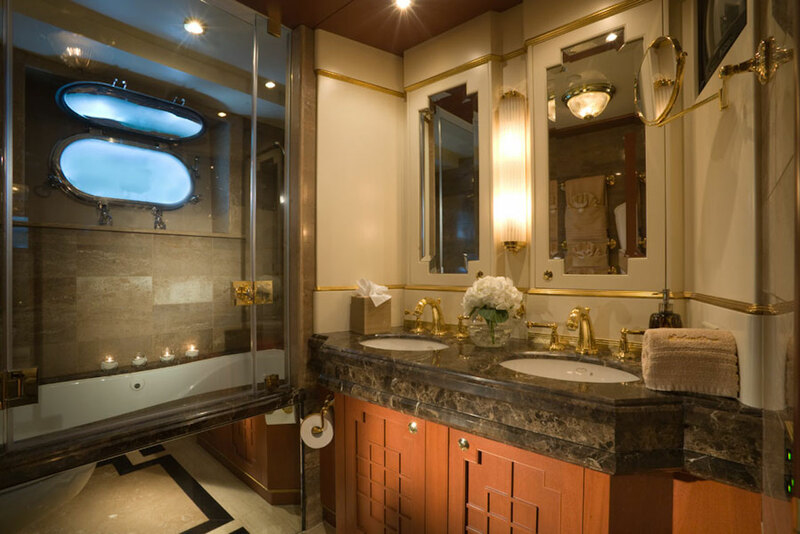 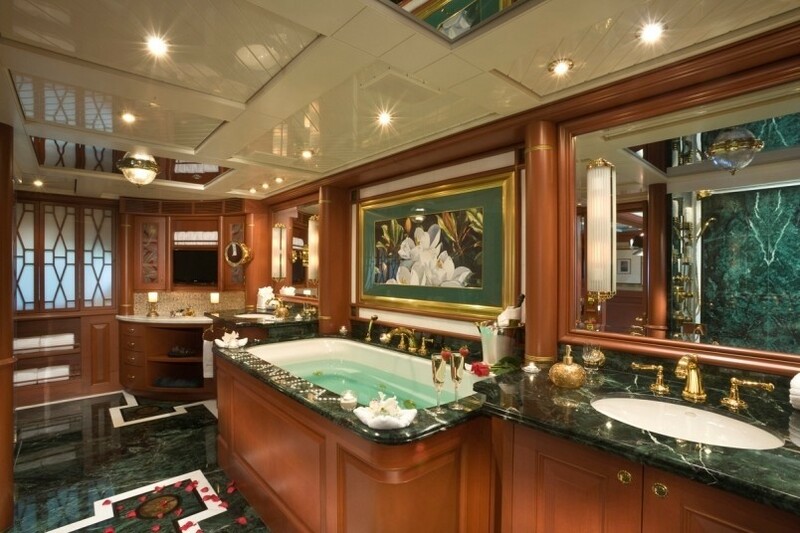 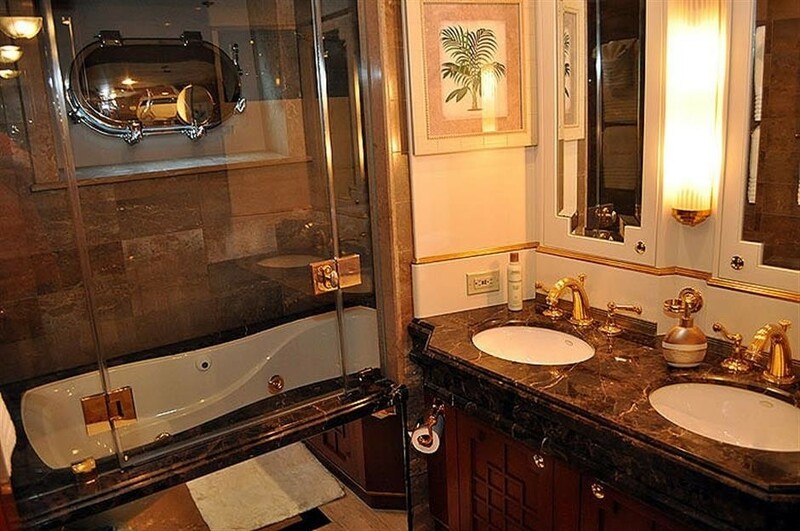 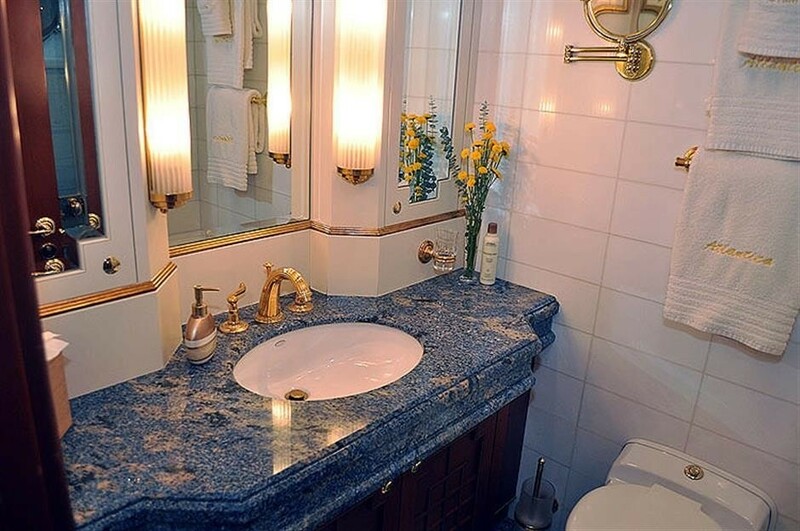 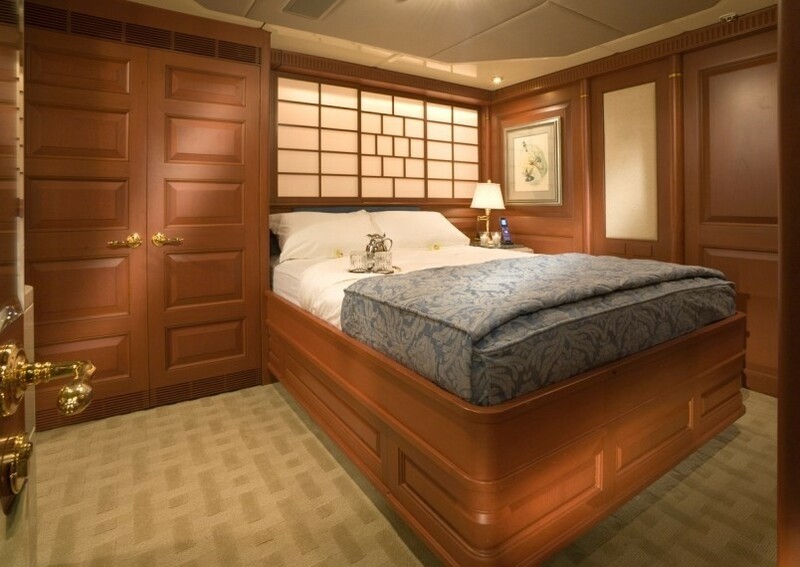 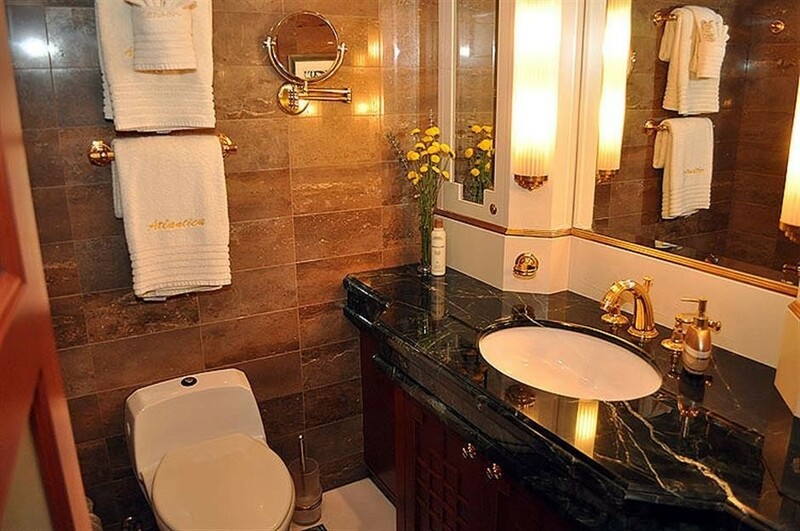 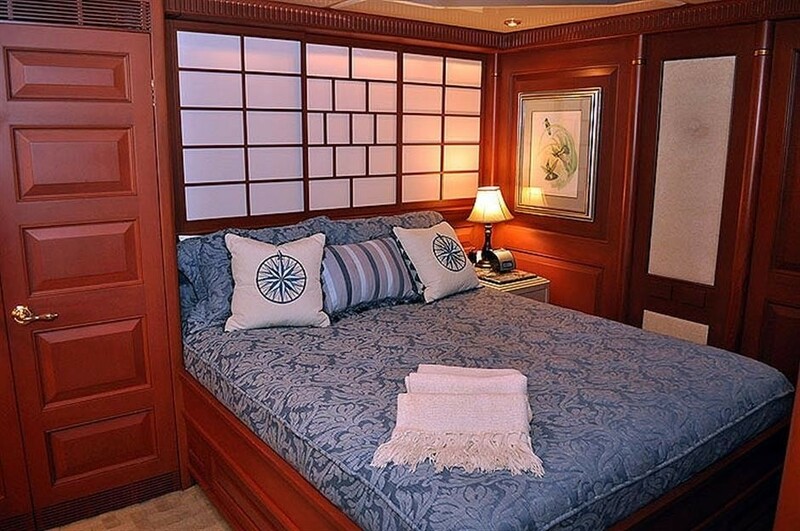 The master suite is located amidships and boasts a king sized berth, a small library, large walk-in closet, a complete entertainment system and a luxurious ensuite bathroom with a Spa Pool tub and his and her toilets and steam and rain showers. 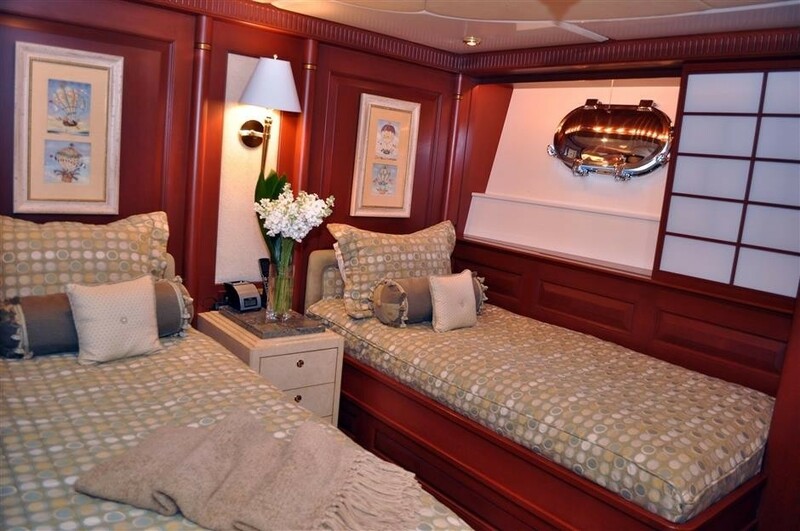 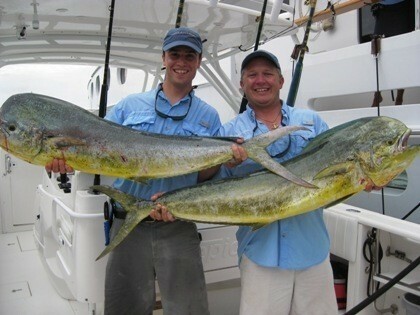 The further guest cabins including three with queens sized berths and one with twin berths. 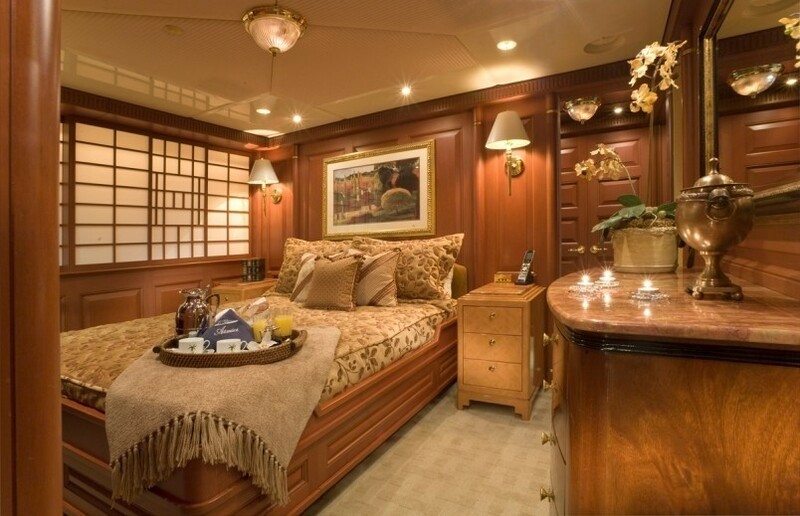 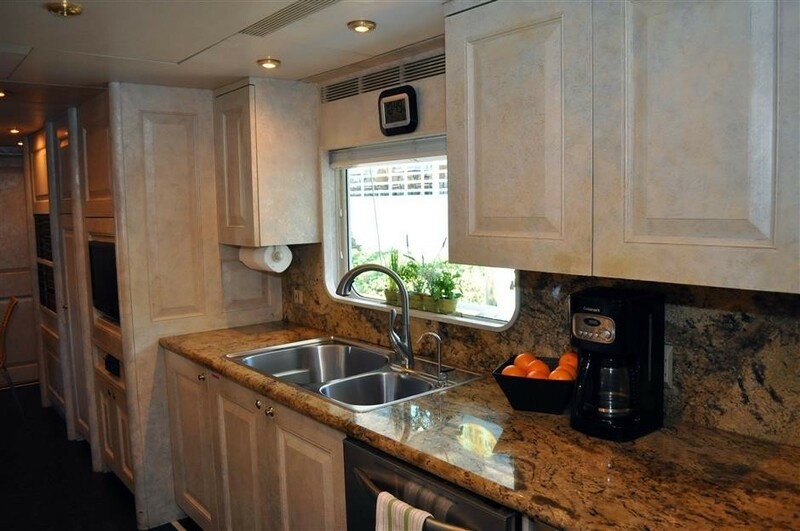 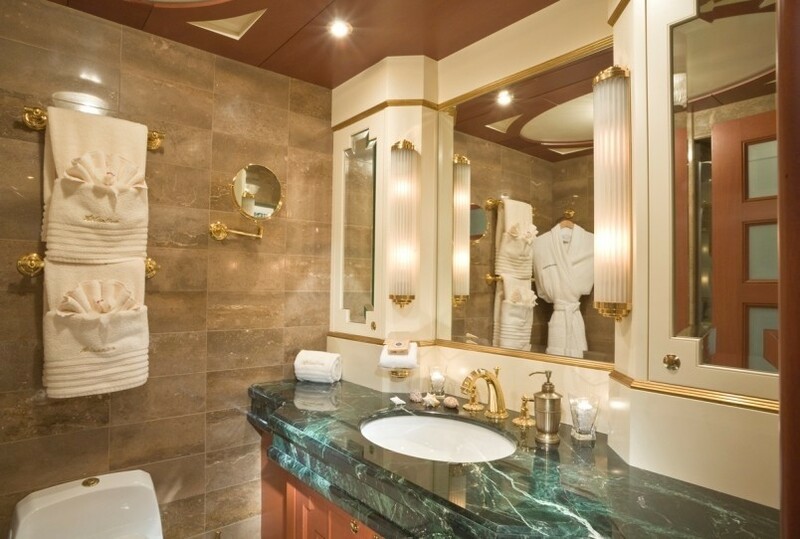 All of these cabins all have high-quality cedar closets, entertainment systems and private ensuite bathrooms with two of the queen cabins benefiting from a Spa Pool bathtub. 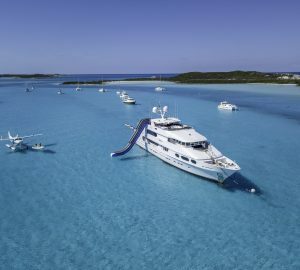 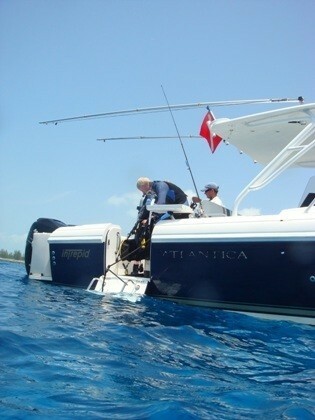 QUEEN D has one of the most extensive ranges of water toys and facilities, including a 37' Intrepid with 3 x275hp outboard engines, a 21' Novurania tender, 2 Sea-Doo RXT's, a donut, a banana, a wakeboard, a windsurfer and a trainer kite. 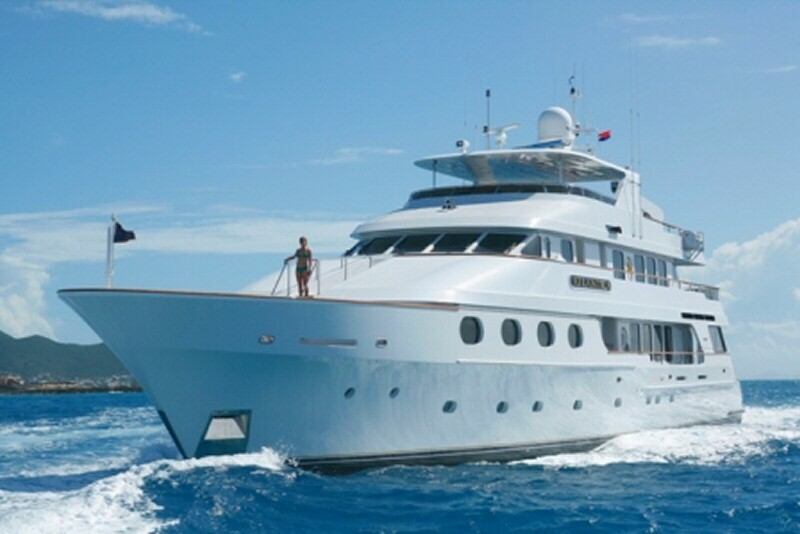 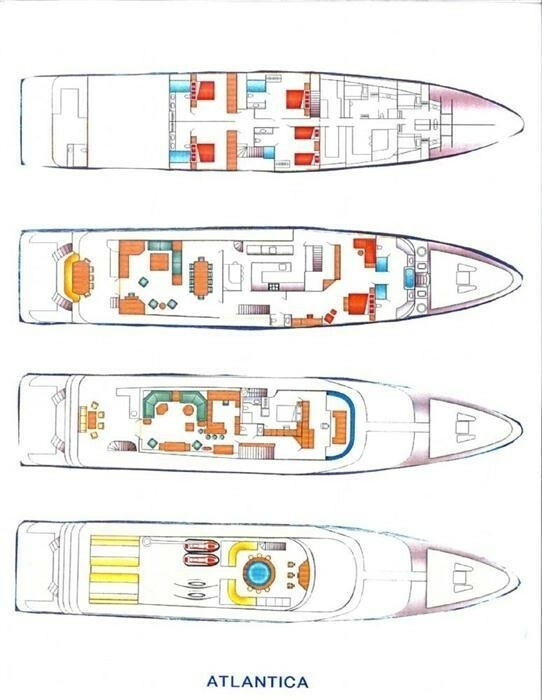 She is also fully equipped for diving and acts virtually as a floating dive centre and can provide nearly every service, a small land based dive centre would be able to offer. 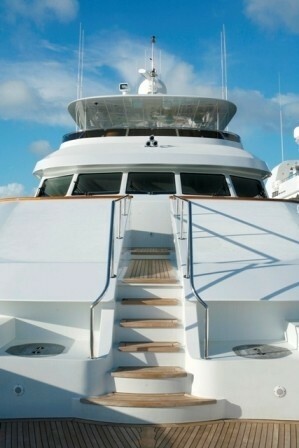 Other additions include a range of gym equipment including a free weight set, yoga mats, a gym ball and jumping ropes.